This beautiful beachfront villa is located inside of the exclusive community called Villas Del Mar within the Los Cabos Corridor. 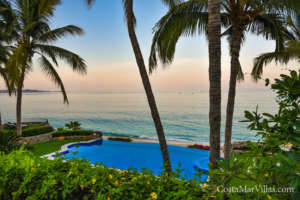 It provides access to the world-class One & One Palmilla resort amenities. 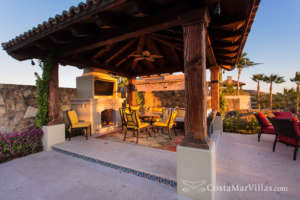 Combining high-end contemporary comforts with vintage colonial charm, the property offers an outstanding setting to enjoy the lifestyle of Los Cabos in peaceful privacy, while at the same time its prime location means you are just minutes from some of the finest spas, golf course, and dining in the area. Three luxurious bedrooms provide the ideal accommodations for destination wedding guests, groups of friends, and families. Nestled against the pristine white sands of the beach, the terrace at the villa invites you to spend hours of enchantment out in the open air. Relax in the infinite pool or hot tub while enjoying the stunning ocean views. Sip on a cool drink out in the sun, or go inside and enjoy the colonnaded, cool veranda. Swim in the crystalline sea and enjoy barbecue meals out in the gentle breeze. In the evening linger outdoors, with kindling in the fireplace and relaxing to the sounds of braking ocean waves. The veranda and the interior of the villas are joined by large glass doors, which allows ocean air to flood into the home. The gorgeous dining room features and table for eight and is joined by an outdoor kitchen and alfresco patio, to accommodate intimate meals or dinner parties. The fully equipped kitchen is a combination of beautiful vintage deals and chef-quality, modern appliances. The bedrooms are all equipped with TVs and en-suite bathroom, which provides a lovely private oasis for each guests for rest and siestas. The master suite opens out into an upper-level spacious balcony featuring an en-suite bathroom with soaking tub and shower and gorgeous four-poster bed. The guest suites also open out onto the balcony. A sofa bed is included in the cozy television den. 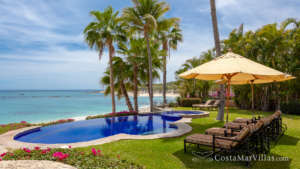 Beyond the private house, you are just minutes from some of the finest destinations and amenities in Los Cabos and Palmilla. Take the complimentary golf cart from the villa to One & Only Palmilla and enjoy its great restaurants and spa; visit the incredible Club Espiritu wellness facilities and experience the Club Ninety Six beachfront scene. Drive about thirteen minutes so you can enjoy San Jose del Cabo’s colonial charm, and around twenty-five minutes to the famous nightlife and beaches of Cabo San Lucas.